There are many solutions to the wonderful "problem" of having too many leads coming into your growing legal practice. Sure, you could hire more people to answer phones and process those leads, but that means a lot more overhead and cost to your bottom line. 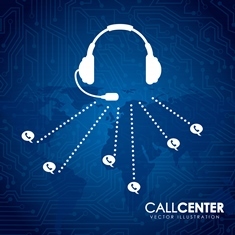 You've probably heard about intake call centers that can help reduce your call burden and convert your leads to cases, but just how does an intake call center work for law firms? If your law firm has one person trying to answer multiple phone calls at once, or several people dedicated to just answering calls for new case leads, an intake call center is what you're looking for. Instead of trying to handle all of your leads in-house, calls to a designated number for your firm are routed to the intake call center. From there, intake speclialists follow a set of criteria and scripts specifically customized to your law firm so the caller never realizes they're not actually talking to a person in your office. Everything from the initial greeting to the questions you want to ask a potential client is customized to fit your requirements. When you work with an intake company like Alert Communications, it's like having more employees of your own. Alert Communications staff follows exact scripts for taking in new cases to ensure that you get the answers to the questions you need to determine if the case is a good fit and build a solid case file. Because all of our staff that handle your law firm's leads are trained in the same procedures and follow the same intake prompts, every case we secure and send to you will be documented the same way. They'll even process your new clients, schedule appointments, email documents to your clients, and more. When you work with Alert Communication's intake call center, you don't have to worry about looking for bilingual receptionists or wonder how you're going to get those leads turned into ready-to-work cases. Our expertly trained staff is ready to provide all those services—and more—to your growing law firm. Never miss another lead again because your phone lines are busy or your receptionist doesn't speak Spanish. To learn more, fill out a contact form on Alert Communnications website or give them a call at 800-801-7628.